I moved to the Midwest in the mid nineties and for more than ten years I did not feel at home here. Hippie and I did a lot of traveling then and I believed that we would eventually wind up moving back to my beloved East Coast or perhaps somewhere out West. I was the anywhere but here girl, always in limbo, always waiting for the day my life would really begin in some other place. Meanwhile, we were growing out of the small house we lived in and the crime rate in our neighborhood was increasing. One day it suddenly became clear to me that we needed to move somewhere fast and that meant somewhere near. We went looking for a home in a better neighborhood. I hoped we would find something a little larger with a basement and a second bathroom. Something we could be comfortable in until we moved somewhere else. What we found was a dream come true. What we found was The Cabbage. 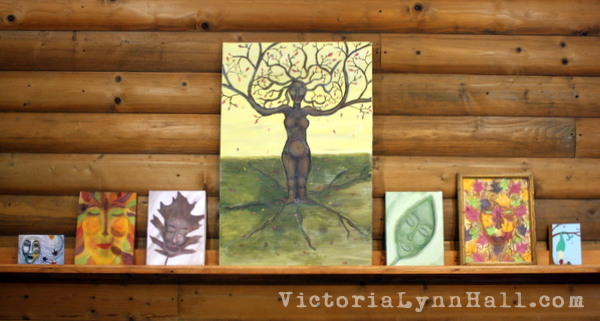 I painted my "Rooted" Tree Goddess in the Autumn of 2006, just a few months after we moved in here. It was the perfect symbol and reflection of how I was feeling at the time. The transplant had finally taken, I was rooted, I was home. 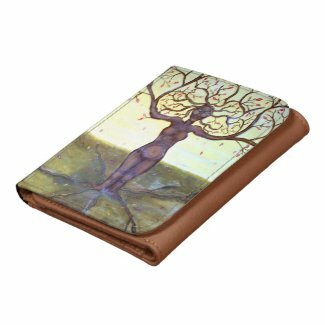 An image of this painting is featured on many products in my Zazzle art shop. The original is currently hanging in my kitchen and is not for sale. Very pleased to hear you feel 'at home' - it's important! Isn't it strange how different we feel in different places and the reason isn't always obvious. Thanks, Judy. I find the more secure I am with who I am, the less it matters where I am but I agree, it is important to feel at home regardless. I want to stay at your Cabbage Bed and Breakfast! Love the painting and story behind it. Thanks Mary Claire! We would welcome you any time.